Summer 2017 marked the end of the first year of the new third year curriculum. Dubbed the Year 3 Transformation, (Y3T), it was the first update to the SIU School of Medicine curriculum in more than a dozen years, developed through a $577,000 Macy Foundation grant awarded in 2014. Building on SIU’s nearly 50-year history of risk-taking, Senior Associate Dean Debra Klamen, MD, and the medical education team saw the opportunity to make the curriculum even more student-centered. The goal? To help students improve their clinical skills and decision-making skills and better prepare for residency. The result? Success. Back in 2013, Dr. Klamen began envisioning a new third-year curriculum. Reviews of the third year of medical education had found that clinical experiences were largely random, leading to little growth in clinical reasoning. Students had a long list of more than 600 goals and objectives they were expected to learn in the six core clerkships. Dr. Klamen thought, “What if we embraced the realities of our data and directly addressed the problem?” With the Macy grant, a Critical Clinical Competency subcommittee created the Critical Clinical Competency (Triple C) longitudinal curriculum, an online, video-based, standardized streamer that develops students’ clinical reasoning skills in 12 chief complaints. Students work through 144 discrete diagnoses largely seen in ambulatory and acute care settings. Instead of struggling to meet those goals all in the third year, the Triple C begins in year one and ends at the end of year three, leveling the playing field of exposure to undifferentiated diagnoses. What changed? In the third year, core clerkships of four-week stints in eight clinical disciplines replaced six rotations of varying length; there are no more shelf exams and no lectures. 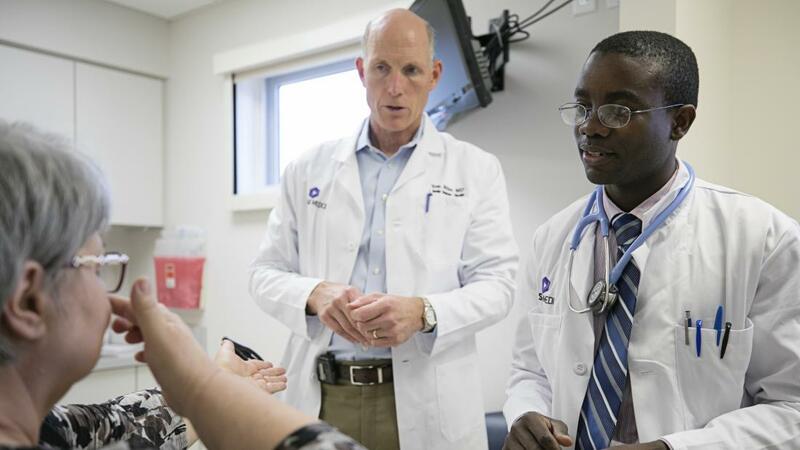 Instead, there is more face-to-face patient time, and more personalized coaching to help students “find their people.” Faculty serve as coaches, providing frequent feedback. An added bonus is the 15-week Personalized Educational Plan (PEP) that gives students and advisors time to develop a plan, or “deep dive,” into professional development. This could mean immersion in a specialty in students’ area of interest, remediation, or even graduation by the end of their third year. Students helped design the PEP, and almost 100 faculty are trained as coaches. Also in the PEP, students have the option of taking humanities courses, optional shelf exams or time off. During the three-week intersession between the Core and the PEP, students take a 14-station standardized patient exam, as well as a week of humanities. “It was a radical idea,” Dr. Klamen acknowledges of Y3T. But it has been well accepted, despite some initial concerns expressed by busy clinicians, like Susan Hingle, MD. “I think the realities of the clinical environment with the need for clinical productivity still makes the curriculum a challenge, but overall it went quite well,” Dr. Hingle says. Class of 2018 student Allen Ghareeb says his classmates were a little skeptical of the changes, especially the lack of shelf exam and didactics. “Having been at SIU for two years we’d been conditioned to move away from didactics, but it was still scary,” Ghareeb says. • Students say they worried less about studying for the shelf and step exams and enjoyed the increased feedback and the close ties they formed to faculty members. They also enjoyed the range of options available in the PEP and more time with patients. • Faculty and residents embraced the new curriculum and preferred the apprentice-style model — getting to really know the students and not having to refer to mug shots to recognize them. A few tweaks and re-evaluations were needed. Some students received more verbal than written feedback from faculty, which made grading difficult. This also made it hard to determine honor status, so honors rankings have been removed, leaving the basic pass/fail grading system. The emergency medicine clerkship has been extended from two to four weeks. Additionally, some faculty and students struggle with the four-week core clerkships and prefer a longer model. Others want more electives in the PEP. The Y3 Curriculum Advisory Committee is reviewing these suggestions. For Ghareeb and his fellow students, the increased clinical experiences assuaged their fears. Ghareeb’s favorite part and the “gemstone” of third year was the PEP, which allowed him the freedom to design experiences for him to explore specialities. He dove into subspecialties in internal medicine, psychiatry and a self-designed selective on HIV care in central Illinois and on a pharmacy team to learn that aspect of medicine. “Both were incredibly beneficial,” he says. His HIV project has morphed into a research project, addressing barriers of access to care in rural communities. “We were done with the cores by February and had five months to explore. That set us ahead of the other third-year students in the country,” Ghareeb adds. He ultimately “found his people” in OB-GYN and as he entered residency interview season, he says the additional experiences reaffirmed his choice. The future: SIU School of Medicine’s history of risk-taking and innovation in curriculum development continues — and continues to succeed. The concept and initial success of the third year has also been well received by other medical schools, Dr. Klamen says. She has presented the Y3T to many audiences, and says that SIU SOM is so renowned for medical education that she, as the school’s representative has become somewhat of a celebrity in medical education, complete with autograph requests. The team praises the faculty, residents, clerkship directors and nurse educators who were essential in making Y3T a success. The Triple C online curriculum is available to medical schools who request it. Data collection continues and Dr. Klamen plans to publish results in upcoming months.